Metal hoses are available in all shapes and sizes. A key product within the hose industry is the flexible metal hose range, that are able to be used in a wide range of applications to ensure that you employ the best fitting and serving hose for its requirements. The convolutions that make up the flexible hose are used to reduce the design limitations, ensuring flexibility allowing suitable usage in its application. Flexibility is achieved by means of elastic behaviour of the corrugation profile, whereby the outer corrugations separate while the inners are squeezed together. Pressure resistance and flexibility can be altered by varying wall thickness, while the reduction in wall thickness means that the bending capacity is increased, and the pressure resistance of the hose is decreased. Stainless steel is the most common metal used to produce flexible metal assemblies, and there are a number of different trade names available. Flexible stainless steel are supplied with up to three highly compact stainless steel braids depending on the type and bore of the hose, which enables them to perform appropriately at high pressures. Flexible metal hose provide the best of both worlds when it comes to strength and usability, with its metal materials it will provide sufficient strength for many applications while its flexibility will ensure that it can be used in the most intricate places. Flexible metal hoses can be found in many different forms, making sure that there is one suitable for your arrangement. 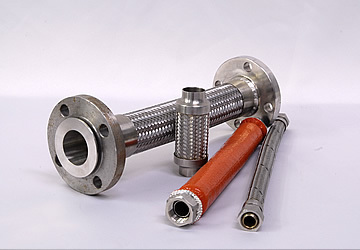 Custom hoses can also be designed for those applications that are particularly specialist.